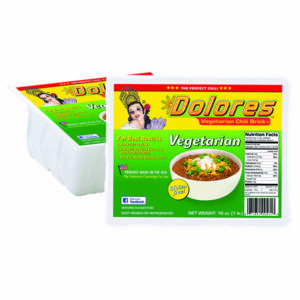 Dolores Vegetarian Chili Brick®, also Gluten Free, is the newest Chili Brick product in the Dolores family. It’s crafted with the same Dolores family recipes that made the original all-beef and chicken brick famous. Like the other bricks, Vegetarian Chili Brick® is frozen in the brick shape and sold in 16-ounce (1-pound) and 5-pound packages in chain and independent grocers. Chili Brick® is an Award Winning Chili. Use our Dolores 16 oz. Vegetarian Chili Brick. It simply goes from our box to your meat case. Our chili sells best in the fresh meat case next to the ground beef and sausages. Use our Dolores five-pound Chili Brick for your Restaurant, Catering Trucks, or Hot Deli. Easy to use, great taste and low cost per serving.